Pinasgifts.com is always concerned about your desire on how you want to present your gift to someone special. 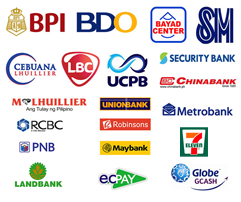 We prepare your gifts at Metro Manila and deliver nationwide in a convenient and efficient way. We pack and wrap gifts with a card that contains personal message from you! We guarantee you the highest quality of our product and service. Our priority is to deliver your gifts on time. We Do Not Delay! If it is within Metro Manila Phil Gift’s delivery team deliver it at the same day. We ship your gift order through country’s leading courier like Aboitiz Express and LBC if it is outside of Metro Manila. We aim the safety and security of the product when it is transported. We prepare immediately after purchase. We deliver or ship it within an hour unless specific date mentioned. We do also deliver according to mentioned delivery time and date. We require recipient’s signature upon receiving the gift. PhilGift provides receipt for recipient and you will receive an email for verifying receipt of your order. Our main goal is to satisfy and delight consistently our customers. Our products are guaranteed Quality Control pass. For food and flowers we preserve its freshness. We say, place an order rest of cares we will handle it! This way we help you make your gifts special and give you the opportunity to send fast and inexpensive.